That’s all folks! 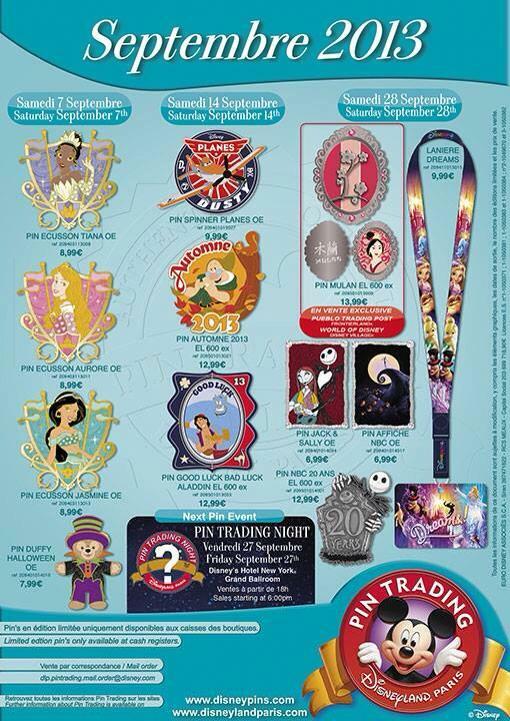 The Summer holidays are over and we’re back into Autumn and another month of pin trading releases. We’ve been blessed with great pins so far this year, with some fantastic collections appearing on the poster each month, is September any different? Of course not! Whilst the princesses continue throughout 2013 at Disneyland Paris, they have been joined by an excellent looking Halloween Duffy, which looks an utterly charming pin. These Duffy pins of late have been very well designed. The usual Dwarf season pin, this time Doc will be welcoming us into Autumn and its beautiful yellow-orange colours. Dusty the Plane will be flying into Disneyland Paris boutiques in an open edition pin that’s sure to attract the children’s attention. The excellent good luck/bad luck spinner series continues with this Aladdin/Genie pin. Thought the Princess Medallions were finished? Of course they aren’t, this time Mulan will be getting her medallion, Disney Dreams! is finally getting a lanyard featuring all the beautiful images and characters from this spectacular night-time show. Fans of the Nightmare before Christmas will be happy as well, with three pins dedicated to the film, perfectly timed for its 20th anniversary. We love this month’s pins and lanyard, a real must for our collection is the Autumn Doc pin (Seasonal pin collection! 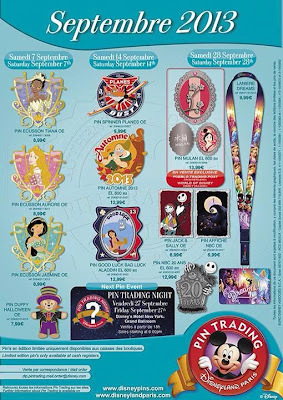 ), as well as the Nightmare before Christmas 20th anniversary pin. We’d also love to add that lanyard to our Disney Dreams! pin collection.